To understand the nature of Arab medical schools in the Arabic Islamic World, we have to deal with the status of medicine before the 12th century; the Bimaristans: their system and different purposes; medical educational assemblies: their role in configurating physicians’ minds and the method that was followed and then conclude with the results. It is worth noticing that examples have been provided. The ancient sources inform us about Al-Harith especially Ibn Golgol , the most famous historian in the fourth century of Hijra (10th century), who said that Al-Harith «studied medicine in Persia and Yemen and was alive in the days of the Prophet(1). According to other sources (2) , the Prophet advised Saad Ibn Abi Waq’qas when he was sick to consult Al-Harith, the physician. 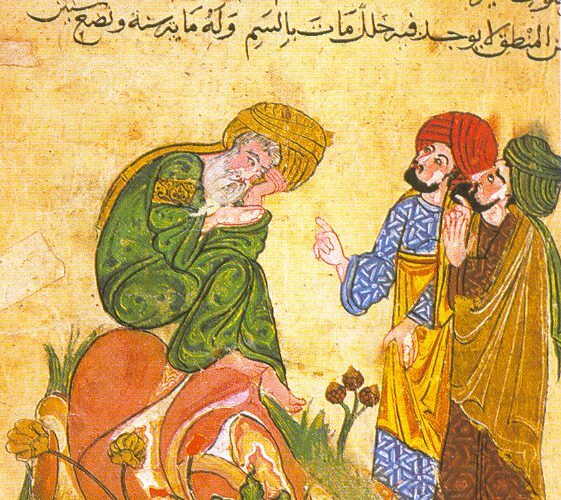 The power and authority of physicians began to increase during the rule of Mu’awiyah (660-680), who founded the Umayyad state. Mu’awiyah ordered his men to bring the best physicians from Jundisabur to care for his health, specially that he was afraid his enemies (3) might poison his food. No doubt the successive physicians made great contributions and were the pioneers of medicine during the rule of Mu’awiyah and his sons. During the rule of Umayyad Caliph Marawan Ibn al-Hakam (d. 685), the Persian physician Masarjawayh played a vital and effective role, when he started, by order of Marawan, to translate the Medical Encyclopaedia of the Alexandrian priest Ahrun, from Syriac into Arabic. Masarjawyh’s translation of Ahrun’s book is considered to be the first translation of a medical book in Islam from a foreign language into Arabic (4) . The Abbasids represent a very strong and important stage in the development of science, because they encouraged scientists, and tried to establish a solid scientific movement in the Islamic world, especially after they chose Baghdad to be the new capital, instead of Damascus. As we know the Abbasids were rationalistic. Most of the Caliphs were among the “Mutazilah scientists. The adoption of rationalism led to the flourishing of the sciences through the Islamic academy of science “Bayet al-Hikma” (5) (the House of Wisdom). Hunain b. Ishaq (194-264 H.) who took the lead in the official movement of translation, was one of the most important figures both in translation and medicine. He translated the books of Hippocrates and Galen, and wrote down many medical books among which is his famous one about the eye (Al Ashr Maqalat fi al-‘Ayn) The Ten Treatise on the Eye – Max Meyerhof verified and studied it critically (7) . The book of Hunain is considered the first scientific attempt towards Ophthalmology. Ancient Arabic sources – like al-Qifti (8) and Ibn Usaibi’ah (9) – mentioned that the real organisation of medicine took place by the order of al-Muqtadir who wrote to Sinan Ibn Thabit b. Qurrah to examine those who want to practice medicine and give them Ijaza (certificate). This was in the tenth century. Those who learn and study medicine and practice it as a profession must work in hospitals to get experience and practice the medical profession, so that they gain this experience from the cases they examine under the supervision of master scientists. Von Grunebaum says about the necessity of hospital visits for medical students “The medical student must always visit the hospitals and must be very careful of the conditions and situations of the persons found there, while he is accompanied by the most intelligent medical teachers, and must ask about patients’ conditions, their symptoms, remembering what he read about changes and their significance whether good or bad. If he understands these things he will achieve a high rank in his profession (14) . So, it is evident that the medical – teaching in that time – had bases and rules and was practiced in the Bimaristans. To be acquainted with the rules of the process of medical teaching that dominated. The Islamic world, we have to study first the origin of the Bimaristans and their development in order to know their importance for medical teaching generally. Ibn Abi Usaibia’h said: “Hippocrates cared greatly about his patients and their treatment. It is said that he was the first to invent and build the Bimaristan and the first to renew it, by allocating – near his house – part of his garden for the patients and assigned some servants to perform the treatments. He called this the «Akhssendokin», i.e. a patient complex. Also the word Bimaristan-which is of Persian origin-has the same meaning as (Bimar) in Persian means disease and (stan) is location or place, i.e. location or place of disease (15). This is the text we find in the «Uyun al-Anba» of Ibn Abi Usaibi’ah about the historical development of the Bimaristans or hospitals. But Max meyerhof (16) mentioned that the first hospital to be built in the Islamic world is that which was based in Baghdad by the order of Harun al-Rashed; then hospitals were built successively everywhere. Does Meyerhof’s opinion present the absolute truth, or does this opinion contain some clear fallacies? Ibn Qutayibah al-Dainuri was interested in his book Leadership and Politics (17) in throwing light on some important matters relating to Islamic history. He mentioned that the first Bimarastan or hospital was built for the Muslim army-after Abdallah Ibn al-Zoubair when he was blockaded in Mecca, built a tent on one side of the Mosque, so that when one of the Sahaba (Prophet’s followers) was wounded he would be brought inside the tent to be treated and to be cared for by skilled persons. That is how the first type of Bimarastan (hospital) was built in Islam. This is the Arab Bimarastan (hospital). Moreover we find other proofs in (Ibn al-Atheer) in al-Kamel (18) and al Maqrizi in Maqrizi Plans (19) which denote that al-Waleed ibn Abdel Malik was the first to build a Bimaristan it the real meaning of the word in Islam in 88 Hijri. Noushirawy (20) in his new book on Islamic Brimaristans in the Middle Ages seemed to adopt this opinion and he mentioned that the first Bimaristan built in Islam was in Damascus, by al-Waeed b. Abdel Malik (705-715 A.D) and built in 86 Hijri (706-707 A.D.). The aim of its building was treating patients and the care of affected chronic patients-as lepers and blind people… etc. The leprotics were imprisoned, treated freely and given money. In the Bimaristan there were more than one physician. It is obvious that Noushirawy adopted what was mentioned in (al-kamel) of Ibn AL-Atheer on this poing specifically. A person has great importance and consideration on this subject, is Ahmed Bey Issa (21) who was the first to write clearly about the development of the Bemaristan and its history in Islam, and he mentions that the Prophet Mohamed (may peace and prayer be upon him) was the first to order the establishment of mobile military Bimaristans. It is natural that this last opinion has its importance and consideration, because Muslims were rushed in many invasions in which they were attacked and injured. There was lots of chaos, and men were wounded or killed here and there. It was normal that there should be those who cared for these people and looked after their treatment, and hence complete care was provided for the fighters. This last opinion agrees with what Ibn Qutaiba al-Daynuri mentioned. Concerning the technical choice of bimaristanic site they used to choose the best location with regard to the health conditions. They preferred to build the Bimaristans over hills or by rivers. Al Adoudi’s bimaristan is a good example of this; it was built by Adoud al-Dawla b. Bawaih (26) in Baghdad by the River Deglah and the water of the river flowed through its courtyard and halls and returned to pour into Deglah. Ibn Abi Usaibi’ah discribed in his book Uyun al-Anba (28) , the halls of internal medicine which frequently included a section for the patients affected by fever and another one for patients having mania. All sections of the Bimaristan were equipped with all the medical instruments and apparatuses necessary for the physician. Ibn Abi Usaibi’ah tells us (29) that Adoud al Dawla set a test for a hundred physicians, when he decided to build the Adoudian Bimaristan on the Western side of Baghdad, and he chose twenty four physicians out of the hundred to work in the Bimaristan. According to this order and system the Bimaristan was performing its medical job from a diagnostic point of view, disease definition and prescription of treatment. Moreover, they understood the necessity of adjoining a pharmacy to the Bimaristan to give out the drugs, which were given according to the physician’s prescription, and the pharmacy was called «Al Sharabkhana» (30) . And as it is the case today, they used to inspect the Bimaristan. This was the responsibility of an employee assigned by the minister or the Caliph and given the authority to enter the hospital to be acquainted with the patients’ status and the care offered to them, the food given to them and whether the boys were serving them or not. Whether the physician is performing his duty perfectly or he neglecting it. This system assured the stay and continuity of the Bimaristan in a serious way that allowed it to work with a high competence technically, scientifically and administratively. Ibn al-Okhowa described in his book (al-Hisba) the entrance of the patient to the outpatient clinic to see the physician. He said in a very important text «the physician asks the patient about the cause of his illness and the pain he feels. He prepares for the patient syrups and other drugs, then he writes a copy of the prescription to the parents attending with the patient. Next day he re-examines the patient and looks at the drugs and asks him if he feels better or not, and he advises the patient according to his condition. This procedure is repeated on the third day and the fourth… till the patient is either cured or dead. If the patient is cured, the physician is paid. In the early Islamic state, Muslims comprehended the different form and purposes that should be considered in Bimaristans. Normally, they should deal with this point seriously, precisely due to its importance to the patient and the physician as well as the desired degree of care for the patient. Certainly the Bimaristan established to serve the fighters in the battle field during the hustle of the battle must differ from that built for the patients affected by mental disease who do not have to hustle, but doctors might hustle away from them but this is different, or those built for a commercial caravan or the pilgrimage to Al-Kaaba…. and so on. It is worth mentioning that Ibn Abi Usaibi’ah (34) tells us in his book (Uyun al-Anba) about some cases of this type of disease and how the skilled doctor Waheed al-Zambian could treat them. One of the patients thought that he had a tun over his head that never leaves him; he was afraid that the tun might break while he was walking, therefore he walked carefully to avoid breaking it. Some doctors tried to treat him but they failed. Lastly he saw Waheed al-Zaman who realized that the man was suffering from illusions. He told his family: «bring him to the hospital. Waheed al-Zaman ordered one of his boys to bring a big stick and hit the head of the patient-while Waheed al-Zaman talks to him-as if he wants to break the tun that the patient pretends having on his head, in the same time he asked another boy to throw a tun- that he prepared for him-from the house top, the moment the first boy hits above the head of melancholic patient, to the ground. When the patient came, Waheed al-Zaman started to talk to him, disapproved he was carrying the tun, he gave the boy a signal and he started to hit over the head of the patient with the woody stick, in this moment the other boy threw the tun from the house top which caused a great noise and broke to many pieces. When the patient saw what happened to him and saw the broken tun he did not doubt that it was the tun he was carrying -in his imagination – this influenced him and he was cured from his illness. According to Ibn al-Qifi (35) , the first who wrote a book on «Leprosy» was Yohan b. Masaway. The cause of interest in such a disease arises from the Muslim’s idea of isolating the patients who had communicable diseases from the rest of the society. We find the same behaviour with the doctors of today towards such liseases. Therefore, they equipped the caravans with medical missions where physicians worked and had boys to help them. Ibn al Qifti presented to us an important test while he was talking about «Al-Hakam b. Ali al-Hakam al-Damaski», he said «he was a doctor in the beginning of «Al Abbassid state», Mu’awiyah b. Abi Sofian sent him as a doctor with his son Yazeed to Mecca when he sent Yazeed as Emeer of the pilgrimage in that epoch. Al-Hakam said: He is the doctor my father sent with Yazeed when he went to Mecca and I was the doctor who went with Abd al Samad b. Ali b. Abd Alla b. Abbas to Mecca (36) . Undoubtedly, Ibn al-Qifti’s text we just mentioned kept the oldest idea about this type of Bimaristans. Ibn Katheer (37) pointed out in his book (The Beginning and the End) that road Bimaristans were conducted by a wise director who knew how to give treatment: The rich people, who had the ability to equip the caravans with medical missions supported those Bimaristans financially. The Muslims cared medically for the imprisoned the same way they did for people outside the prison. This is clear from the letter the minister, Issa b. Ali al-Garrah (38) Minister of al-Moktader, to Sanan b. Thabit al-Tabeib al-Natassi who was distinguished in Arab medicine and who embraced Islam at the hands of Al-Qaher. After Issa b. Ali had visited the prisons, he found it was necessary to treat the patients and preserve their humanity so, he sent his famous letter to Sanan in which he said: «I thought-May God prolong your life-of the imprisoned and they are exposed, due to their big number and their hard situation, to diseases; they are incapable to deal with their excretions or to meet doctors to seek their advice about diseases. You have – May God grant you honor – to assign physicians to visit them daily and they should carry with them drugs and syrups and all they need to treat the patients and cure illnesses with God’s will. Sinan followed this advice» Also according to what Ibn al-Qifti mentioned al moktader asked Sinan b. Thabit to build a Bimaristan and give it his name. He ordered one at Bab Al-Sham and called it The Moktader Bimaristan and financed it with 200 Dinars monthly (39) This was in 306 Hijri and Sanan b. Thabit was assigned as chief doctor. When al-Moktader was told that one of his physicians had killed a man by mistake, he ordered Sinan to perform a test for the physicians. So, they were tested in Baghdad and their number became eight hundred physicians (40) . Ali b. Issa al-Garrah – al Muqtadir’s minister – ordered the first state physician Sinan b. Thabit, in a written letter, to let doctors travel to the peripheries of the state. He said in his letter «I thought of people who live in the peripheries and that among them are patients who do not receive any medical care because there are no doctors there. So, assign – May God prolong your life-some physicians to visit the peripheries; also a pharmacy containing drugs and syrups. They have to travel all through the peripheries and stay in each region enough time to perform treatment of patients, then they move to another one (42) . 1- The theoretical method in the medical schools, and 2- A practical method for training and practice where students gathered around the doctor in chier to see and examine the patients and the treatment he prescribed. When the students finished the studying period they applied for an exam, took an oath and got their certificates. When they started to practice medicine, they always worked under the state’s supervision. This means of course that the Bimaristans were institutes for teaching medicine and to complete the study for junior doctors (43) . From a practical point of view, the professors prescribed the treatment for the patients, they examined them in the presence of the students who received their learning through professors, they writing their instructions. They performed these instructions in an organized way and they did a follow up to the patients and hence they acquired the necessary practical experience for a medical student. Muslim contribution in the field of medicine can be exposed throughout three main points which are, (1) the medical assemblies, (2) Al-bimaristan, and (3) the method that they followed. The Arab Historian Ibn Abi Usaibi’ah, recognized and wrote down many things related to science and scientists in his book (Uyun al-Anba Fi Tabaqat al-Atibba) Sources of Information on the Classes of Physicians. He mentioned many characteristics concerning scientists assemblies. The medical assembly of Amin al-Dawla b. al-Thalmeed who knew many languages specially Syriac and Pahlavy as well as Arabic (44) , devoted himself to teach new generations, with the condition that they should master the Arabic language, and if any of his students committed grammar mistakes or if his Arabic seemed not good in construction he sent him to a grammarian to take care of and examine him after that. The assembly of Amin al-Dawla b. al-Thalmeed was probably the biggest assembly of science held at that time. Ibn Abi Usaibi’ah mentions a quotation by Mowafak al-Deen Abdel Latif b. Youssef to have said: «A man entered upon him bleeding in summer time so he asked his pupils who were approximately fifty and they did not know the illness» (45) . Most educational assemblies acquired the form of a debate. Seif al-Deen al-Amidi’s assembly adopted this form and eventually people praised «his eloquence in debating and research» (47) . So did the assembly of Shams al-Deen Ibn Al-Laboudi who «became strong in arguments, good at debating» (48) . Arab physicians’ way of teaching had its characteristics and Abou Bakr al-Razi, maybe the physicians’ leader and one of the best physicians of his time to preserve for us in their writings the essentials that a physician should know well, and that teachers should engrave in the pupils mind. This quotation refers to many things in the field of medical education by these professors and their assemblies either in the Bimaristans or outside them. Al-Razi’s educational assembly was of two kinds, one for theoretical teaching the other for the practical one (51) . Theoretical teaching took the form of debates between three groups of students; the group in the circle nearest to him were the more advance in learning and practice. Next came the second group of those with less experience and last came the third circle in which new students were grouped. He read to them, explained, argued and listened to their debates answering their queries. Whenever he detected an intelligent pupil he moved him to a circle nearer to him in which he had to spend three years. So he spent one year in each circle. During this period he was taught anatomy, physiology or organ properties and pathology. As for the practical teachings, like during his theoretical ones, students placed themselves in circles around the patient’s bed in the hospital. He explained to them rare cases one after the other. In this way al-Razi used the patient as a book to be read daily and continuously to be able to understand the symptoms of his illness (52) . Mohazb al-Deen abd Al-Rahim b. Ali al-Dakhwar’s assembly in the second half of the sixth century Hijri and the first quarter of the seventh century Hijri, was the same. Students used to gather around him in the Bimaristans while he examined patients. He taught them and explained the cases in front of them. One of his students, Ibn Abi Usaibi’ah, says: «I saw him once in the hall of the fevered; doctors felt the pulse of one patient and diagnosed weakness and prescribed chicken soup to give him strength, he said that his speech and the look of his eyes denoted weakness, then he felt the pulse of his right hand then of the other and said: Feel the pulse of his left hand, we found it strong, he then said: look at his right hand and how near his elbow the vein divides in two branches one remains and can be felt the other moves over the ulna towards the fingers, which we found true. He then said: this is a rare case but some people show this phenomena, and many physicians diagnose it wrong as weak pulse but it is just that they are feeling half the vein (54) . This is the scientific point of view of al-Dakhwar he had inherited from his medical ancestors who had laid the foundation of medical practice in the Islamic world. This is not strange, as al-Dakhwar studied al-Razi’s writings and understood it well. He absorbed the instructions and descriptions of clinical cases that al-Razi mentioned in his book (Al-Hawi). Al-Dakhwar’s system in theoretical teaching had a special character. He scrutinized the next he had, and tried as much as possible to bring out a text without mistakes, whenever someone read to him, “he would have a copy of the text in his hands, he looked at it, and compared it, if he found a mistake in the copy being read he would order its correction” (56) . Al-Dakhwar persisted in the accuracy and precision of the copy, Ibn Abi Usaibi’ah says: Sheikh Mohazab al-Deen’s copies that were read to him were very accurate, most of them were in his hand writing. He surrounded himself with all he needed of medical books language books Abou Hanifa al-Danoury’s botany book (57) . These are the tools that a scientist needs to perfect his research. After Al-Dakhwar’s assembly was over and the attedants left, he returned to his private life ate something then spent the rest of the day studying and reading and stayed a good part of the night working (58) . This was al-Dakwar’s scientific assembly, where, he taught many pupils and physicians. He wanted scientists to remember him and commemorate him, therefore he transformed his home into a school for medicine, and it was considered one of the best known schools in Damascus, and was known in the history of Arab medicine as the Dakhwarian school the reputation of which in the seventeenth century Hijri spread all over the world. And from it graduated many well known doctors who spread all over the world presenting mankind their knowledge and studies. Al Dakhwar succeeded in inspiring his students with the correct scientific doctrines which he himself had learned in his teacher, Tag al-Deen al-Kindi’s assembly. This was very clear in his other interests besides medicine. Actually, Ibn Abi Usaibi’ah preserved for us a great treasure in his book (Uyun al-Anba fi Tabaqat al-Atiba). In this book he deals with physicians not history, but at the same time he praises the interest in history, al-Dakhwar was not only a great figure in medicine during Ibn Usaibi’ah lifetime, nor was he only a Sheikh who taught this historian doctor, nor only did he establish a school well known in the Islamic world, and that became a true science institute attracting researches from all places, but he also wrote the history of medicine in consecutive periods, relating to his pupils among whom was Ibn Abi Usaibi’ah what he remembered, and what he heard from his elders about the science and views of his predecessors. This is not strange as al-Dakhwar the scientist and doctor was a descendant of Tag al-Deen al-Kanadi, who taught him how to look for the truth and seek its origin, this is the characteristic of a true scientist who ascribes sayings to their owners and not take the credit himself for science and learning and diminish others’ abilities, as some ignorant people do nowadays pretending to know everything and deny the merit to others. We have many examples of what Ibn Abi Usaibi’ah wrote, which show al-Dakhwar’s views who connected good ideology to good morals and so spoke truthfully and honestly (59) . Though it is difficult to claim that Muslims had clearly written about method – as it is the case today – it is obvious from their writings that they followed a precise scientific method in studying and teaching when they talked about the topics they wrote and wanted people to learn. Scientists and physicians in the period of the flourishing Islamic state achieved brilliant scientific results, which – for certain – were transmitted to the Western world, to Latin Europe, and European science benefited from them, during the Renaissance epoch. This made Ali Sami al-Nashar, when speaking about influence of the Islamic method on the West, assert while writing his introduction “I knew for sure that I am in front of the greatest discovery that the European world had ever known which is the discovery of experimental methods of the Islamic world in its most perfect form” (60) . Though scientists in the capital of the Islamic state and in its peripheries did not have specialized clear writings – which we call method – the rules and regulations and the steps were clear in their minds and they used to draw the attention of the reader and the student to its importance from time to time. It is familiar to find some diseases that have similar symptoms to the extent that makes the distinction between them require a highly skilled physician. Muslim physicians have dealt frequently with such matters. We know this through several examples and observations found in the history of Arab Medicine. Here is al-Razi (61) who was known by his medical and scientific skills an intellect whom European medicine acknowledged before even Arabic medicine. He described in his study (Small Pox and Measles) the symptoms of small pox – which he saw himself – as follows: “the appearance of small pox is preceded by a continuous fever that causes back ache and itching in the nose and shivering during sleep”. Example 1: Qualitative Observation Al-Bughdady was interested in the study of Diabetes Mellitus symptoms. He mentioned in two successive paragraphs “while examining the urine you must observe the amount whether a little or a lot, the colour of urine, its taste, and consistency i.e. whether it is thin or thick…”. In another paragraph he said «while examining the urine we should examine three things: the colour, the consistency and weight, in addition we have to examine the odour, the temperature by putting your finger in it, as well as its sour taste» (62) . Example 2: Comparative observation and the relation between sensation and intellect Al-Bughdady did not stop following his observation. He proved that Galen committed mistakes. Galen mentioned that the lower jaw in human beings consists of two parts attached together by a joint at the chin, but al-Bughdady could – through his precise observation – describe the real situation which is: the lower jaw in the mammalians consists of two parts which unite together sooner or later, the degree of union increases or decreases to form strong symphysis at the middle of the chin in different types of mammalians. In high mammalians and human beings the union of bone at the middle of the chin occurs strongly immediately after the delivery so that the lower jaw forms a single bone (63) . Al-Bughdady was acquainted with the reasons of Galen’s opinion on this point, but his observations contradicted what Galen assumed and hence he could, through concentrating his attention on what he observed, realise the point of similarities and differences of what he had in front of him, being provided with an ability of precise distinction and understanding. Muslim physicans were concerned with referring to experiment because it is the best witness to the correctness of an opinion. That is why al-Razi mentioned in his book (The Characteristics of Things) many texts on experiment, “we add what we know by experiment and people know that we do not give our confidence to anything except after its test and experimentation” (65) . Al-Razi believes also that the skilled physician must have two characteristics together “one, he should be skilled in the scientific art of medicine and the other, he must have at the same time a lot of experiences” (66) . From this point of view, we find that al-Razi was committed always to experiment as it is considered the principal criterion in judging things. As long as experiment is the criterion that the physician always resorts to “to distinguish between the truth and the falsehood in what concerns these caracteristics that might be submitted to the denial of those who could not understand the aims of science” (67) . Muslims were skilled in the art of medicine and they achieved important achievements, they attributed in the way of distinction between one disease and another and the definition of many of communicable diseases which can be called epidemics. They did not only distinguish between communicable diseases, but they described each disease separately from the observations they made and the signs of disease occurrence and progress. There are many examples to demonstrate this fact. For example, al-Razi was the first to describe precisely and clearly small pox and measles (68) . Ibn Zahr was the first to describe mediastinal puncture, dry peritonitis and peritoneal effusion” (69) . We can notice the precision of that description which al-Razi presented in the distinction between small pox and measles where he says “the appearance of small pox is preceded by a continuous fever which causes backache and itching in the nose and shivering during sleep. The important symptoms that denote its occurrence: backache with fever and burning pain all over the body, facial congestion and sometimes facial contractions, acute redness of the cheeks, eyes pressure sensation in the body which extends to the muscles, throat and chest pain accompanied with difficulty of breathing, cough and restlessness. Irritability, nausea, anxiety are more pronounced in measles than in small pox (70) . Al-Razi mentioned the cough of hereditary infections. The opinions presented by al-Razi were not only the results of his own efforts, but when he talked about many of the diseases, he gathered, first the opinions mentioned on the disease, by the Greeks, Syriac, Indians, Persians and Arabs, then he presented his own opinion and the experiment he performed and the observations he achieved after the process of diagnosis and treatment. In surgeries, he was a head of his contemporaries because he treated renal and bladder stones surgically. As Hitti descriped him in the field of surgery he was one of the first to use the seton. Among other examples we find Avicenna who “distinguished between pneumonia and pleurisy, acute and secondary meningitis, intestinal and renal colics” (71) . Also, there were some important additions presented by Avicenna, where we find” the first description of anthrax which the Arabs called “The Persian Fire (72) . Avicenna mentioned that the infection occurs through water and dust. He described the life cycle of Ankylostomiasis (73) and he showed its effect on the body. Anatomically, Avicenna described all the organs, even the anatomy of teeth and jaw bones. When talking about the nerves and muscles he included the nerves of the face, forehead, eye globe, eye lids, cheeks, lils, tongue as well as the nerves of the marrow and chest. When he talked about “the nerves”, he studied cases of paralysis. He described hemiplegia and distinguished between two main types: the first is the facial palsy resulting from a central cause in the brain and the second due to a local or peripheral cause (74) . It seems that the treatment of the causes of paralysis were familiar to the physicians of the Islamic world of that epoch. This was the result of their interest in treating skillfully mental diseases. They specified particular words in the Bimaristans – as for example they used one of three methods to treat such cases (we mean caes of paralysis and neurogenic diseases). In cases of paralysis they resorted to cooling drugs in contradiction with the familiar Greek method, which used the hot methods of treatment; or they resorted to methods similar to electricial shocks used in our days, as we have been told by some contemporary historians. Muslims were the first to use electricity to treat epilespy and neurogenic diseases by using a certain type of fish called Torpedo or cramp fish, which was put alive in water which was then connected to two straps of steel. When the patient held them, which he could not do but for a short time, he shivered and would throw them to the ground. After some days of this treatment he was cured from epilepsy (75) . The third method was based on psychiatric treatment and there are many examples for this. Harun al-Rashed had a slave maid attained by a certain type of hysterical paralysis. When she raised her hand upwards, the hand stayed hanging up. The physicians were perplexed in her treatment, therefore al-Rushed brought Gabriel Ibn Bachtishou to treat her. He asked for his safety while he performed the treatment in front of him and he said “if the Caliph will not be angry with me I have some tricks for her” al-Rashed said” and what are they?” the doctor said “the slave must come here in the presence of everyone till I do what I want and you must give me time and not be angry with me quickly. Al-Rashed ordered to bring her, when Gabriel saw her, he walked quickly towards her and bent her head and caught the tail of her dress as if he wanted to undress her in front of all the people; she was shocked and worried by this behaviour and her shyness obliged her to drop her hand downwards to hold her dress and to cover her body. At this moment, the physician turned towards the Caliph and said: “She is cured now” (76) . We find also that Muslims knew in detail other important diseases whose diagnosis was not known in the old medicine (77) . They were “the first to write about leprosy and the repair of the not known in the old medicine. They were ” the first to write about leprosy and the repair of the teeth closure defects and tooth arches. They correlated piles with gastric contraction and recommended plant foods for its treatment”. They were also “the first to draw attention to the shape of the nails of the tuberculous; they described treatment of jaundice and cholera, they used opium in certain doses to treat haemorrhage, and they treated shoulder disclocation by the surgical method known as sudden resistance reduction (78) . Moreover, al-Tabari was the first to discover the insect causing scabies. Among the medical features of Muslims worth mentioning is Surgery. They were the first to use anaesthesia in surgical operations (79) . Abu al-Kaseem al-Zahrawi (Abulcasis) is considered “the greatest one to perform manual works skillfully in surgical operations and to use surgical instruments. His book presentation to those who failed to write consists of three parts: the first in medicine, the second in pharmacology and chemistry, and the third in surgery (80) . The previously mentioned reference of al-Zahrawi is considered to be one of the most important text books in the description of instruments used in performing surgical operations and the way to use them, kwith the detailed description of each instrument through illustrations and he acquired a great importance because he was the first in this subject (81) . Al-Zahrawi was the first to succeed in tying arteries to stop haemorrhage (82) . The Arabs knew in this epoch the anatomy of pulmonary arteries and veins. Not only this but Iban al-Nefis presented to us for the first time in history a complete description of the blood circulatory system. b) Not to take credit for others’ creativity. 1- Scientists throughout the Islamic world understood the Greek medical heritage, first they translated it magnificently by the care of Hunain b. Ishaq who travelled the nations in all directions searching for manuscripts and lost pieces (shreds of them. Ibn Al-Nadim, Ibn Golgol, Ibn al-Qifti, and Ibn AbiUsaibi’ah, confessed that Hunain’s translations and his school played a great role in understanding this heritage. These writings also transferred to us some of Hunain’s pupils translations, details of the translations and whether translated from Greek or Syriac. It is clear that there were medical assemblies, the most famous of which was that of «Yuhanna b. Massoyweh» Hunain b. Ishaq’s teacher. These asemblies played a good role in increasing the growth of medical knowledge. Al Razi’s assembly was a real school for teaching pupils. These assemblies of teaching medicine, were propagated between the fifth and the seventh century of the Hijri. After the translation era, started a period of flourishing and development as physicians had the opportunity to study from text books and to make clinical observations. 2- The period between the twelfth and thirteenth century was characterized by the propagation of medical assemblies. These assemblies were usually held in physician’s homes. These can seen by the assemblies of Ibn al-Thalmeed and al-Dakhwar, students read with their professors important books and teachers explained the difficult parts. 6- Students attended physicians’ teaching sessions in the bimaristans, after having completed the studies. They were examined theoretically and practically by the physician and were given certificates of graduation but had to practice medicine in the bimaristans under the professors’ supervision. 7- Physicians taught in a scientific way, so, for the theoretical part of the study, there were certain books a student had to read and understand under the surpervision of his teacher, these books were those of Hippocrates, Galen, Hunain, al-Razi and Ibn Sina. The student also had to note the teacher’s lectures, and that, led to the many versions for one writing. For the practical part, the students watched the teacher’s way of diagnosis, and also attended the debates between the professors on some diseases. i) The studies that were done in the Islamic world were strictly scientifically honest. Never did any physician claim the merit for another’s work, but always quoted other’s ideas using precision in referring them to their owner, this gave them greater self confidence and a free courageous opinion. (1) Ibn Golgol, Tabaqat al-‘atiba’ wal-hukama’ (The Generations of Physicians and Wise Men) ed. by Fu’ad Sayyid, Imprimerie de L’Institut Français d’Archéologie Orientale, Le Caire, 1955, P. 54. (2) Ibn Golgol mentioned some stories about the advice of the Prophet to some men to visit physicians when they become ill. But Fu’ad Sayyid who edited the book of Ibn Golgol and verified it refuted-these stories, Ibid, P. 54. (3) Some historians such as Ibn Abi Usaibi’ah used to say that Mu’awiyah used his physician Ibn Athal to get rid of his enemies. Ibn Abi Usaibi’ah Uyun al Anba, ed. by Nazar Reda, Dar Al-Hayat Publishing House, Beirut, 1965. P. 171. (4) Max Meyerhof stated that “It was a Persian Jew, Massarjawaih, who translated Ahron’s Pandects into Arabic and was responsible for what was probably the earliest scientific book in that language”. Meyerhof, M., ‘Science And Medicine’, in The Legacy of Islam, ed. by Sir Thomas Arnold & Alfred Guillaume, Oxford University Press, 1952. P. 314 -5. As Ibn Abi Usaibi’ah stated: Ahrun was an Alexandrian Physician and Christian priest. He devoted himself to medicine and wrote his main Encyclopedia of Medicine. Massarjawiayh translated the book of Ahrun from Syriac into Arabic, and after that Hunain b. Ishaq made corrections to the book. See: – Ibn Abi Usaibi’ah, “Uyun al-anba”. P. 232. (5) When al-Ma’mun established Bayt al-Hikma (The House of Wisdom) he stipulated that the rulers of the countries he conquered must submit the books instead of the Jiziah. The ancient sources mentioned that when al-Ma’mun achieved his great victory over the Rum (830 A.C.) he knew that they used to collect the Philosophy books in the cellars. Al-Ma’mun asked their king to give him these books instead of the Jiziah. Teofils (ÊíæÝíá) the king accepted and considered it a great gain for him, but al Ma’mun considered it a great blessing for him. see: Faroukh, O., The History of Arab Science, Dar al-Ilm Li-Al-Malayeen, Beirut, 1977, P. 113. (6) Jundisabur was the famous centre of medical sciences before Islam. Its hospital (bimaristan) was founded to absorb the Graeco – Alexandrian medical sciences. Many physicians , especially the Syriac-speaking Christians, contributed in developing medicine in that hospital, also they took part in the early medical movement in Islam. Maurice Gaudefroy – Demombynes while he was comminting and descriping the status of Arab physicians informed us that “like the theologians, they profit by the Greek heritage, but not by its teaching of the art of reasoning; they make use of the whole range of Greek learning, first through Syriac translations, and later, directly from the originals. The Monophysite medical centre at Gundeshapur was, from the 5th century, both a university and a school of medicine, to which the “Abbasid Caliphs turned for their physicians, and which gradually migrated altogether to Bagdad.” P.204. Maurice Gaudefroy – Demombynes, Muslim Insitutions, trans. from the French by John P. Macgregor, George Allen & Unwin LTD, London, 2nd impression, 1954. Meyerhof, M., “Science And Medicine”. P. 314. (8) Al-Qifti, Ta’rikh al-Hukama The History of Wise Men, Dar Al-Athar, Beirut, p.p. 132 -133. (9) Ibn Abi Usaibi’ah, Uyun al Anba, ed. By Nazar Reda, the library of Dar al-Hayat, Beirut, 1965. Also, A.Muller edition, Cairo – Konisberg, 1882. (10) Professor Hamarneh noted as a result of his investigation in the field of Arabic Medicine that “medicine and allied sciences, for example, were first imported but soon improved upon and greatly enriched by significant additions, investigations, and intelligent personal observation, experience, and experiments”. See: Hamarneh, S., “Arabic Histrography as related to the Health Professions in medieval Islam”, P.23, in, SUDHOFFS ARCH IV, Band 50. Heet 1, Marz 1966. (11) Max Mayerhof notes that “The greatest medical work of Rhazes, and perhaps the most extensive ever written by a medical man, is his al-Hawi, i.e. ‘Comprehensive Book’, which includes indeed Greek, Syriac, and early Arabic medical knowledge in their entirety”. Mayerhof, M., ‘Science And Medicine’, P. 324. While Hitti mention that “true to its name al-Hawi was a veritable medical encyclopedia summing up what the Arabs knew of Greek, Syriac, Persian, and Hindi medicine and enriched by the addition of the author’s experiments and experiences” P.116. “The book was first translated into Latin (1279) under the auspices of Charles, king of Naples and Sicily by the Jewish physician Faraj ben Salim, translator of other Arabic medical works” P.116. (13) Professor Watt emphasized the effect of Ibn Sina (Avicenna) in the West by saying “His Vast Canon of Medicine was translated into Latin in the twelfth century and was used much more than the works of Galen and Hippocrates. It dominated the teaching of medicine in Europe until at least the end of the sixteenth century”. Watt, W.M., The Majesty that was Islam, P 228. (15) Ibn Abi Usaibi’ah, Uyun al Anba, P. 45. (16) Max Mayerhof, “Science and Medicine”, in The Legacy of Islam by T. Arnold, The Arabic translation by Gorgeis Fathallah, Dar al-Taleia, Beirut, 1972, P.423. (17) Ibn Qutayibah, Al-Emama We’ll-Seyasa, Leadership and Politics, Cairo, 1328 H., V.2, P 12. (19) Al Maqrizi, Kitab al-Mawa’ez wa al-Eitbar, The Book of Wisdom and Consideration – Maqrizi Plans, Dar Sader, Beirut, V. 2, P 405. (26) Ibn Abi Usaibi’ah, Uyun al Anba, P. 415. (29) Ibn Abi Usaibi’ah, Uyun al Anba, PP. 415. (31) Al Maqrizi, Kitab, al-Mawa’es Wa al-Eitbar, V. 2, P. 405. (32) Ibn al Okhwa, Ma’alem al-Qurba fi Talab al-Hisba, The Features of Relations in al-Hisba, Cambridge, 1937, P. 167. (34) Ibn Abi Usaibi’ah, Uyun al-Anba, P. 337. (44) Ibn Abi Usaibi’ah, Uyun al-Anba, P. 349. (45) Ibn Abi Usaibi’ah, Uyun al-Anba, P. 353. (49) Al-Samarai, K., ‘Who is Abou Bakr al-Razi’, P. 15. Ibn Abi Usaibi’ah who preserved for us Ibn Abi al-Ashaat on The Book of Single Medication he had written says: “Ahmed Ibn Mohamed al-Baladi asked me to write this book, and before him Mohamed b. Thawab, so in this book I wrote about them and their standings, and I started in the month of Rabii al-Awal of the year three hundred and fifty three, and they had reached a high rank in learning medicine, and became experts in its practice, to them and to my pupils and those interested in by writings, you should study, enlarge your knowledge and develop it”. See: Ibn Abi Usaibi’ah, Uyun al-Anba, P. 354. (50) Nagi, K., “al-Razi the Pioneer of Clinical Medicine” P. 30, 35. (52) Al-Samarai, K., “Who is Abou Bakr al-Razi?”, P. 19. (53) Ibn Abi Usaibi’ah, op.cit. P. 732. (55) Ibn Abi Usaibi’ah, op.cit. P. 732. (59) When Ibn Abi Usaibi’ah was researching some sides of Amin al-Dawla Ibn al-Talmeed, he asked al-Dakhwar who repeated to him what he had heard of stories with their references. These were repeated by Ibn Abi Usaibi’ah as he heard it from his master he says: “Al Hakim Mohazab al-Deen b. Ali, he says: Sheikh Mowafak al-Deen b. Ilias b. al-Motran say: my father told me: Ismail Ibn Rashid said: Abou al-Farag b. Thoma and Abou al-Farag the Christian said: We were gathered in the presence of Amin al-Dawla b. al-Talmeed when a woman asked to enter with a young boy, he allowed her, when he saw the boy he told her that the son is suffering from burning while urinating and urinated sand. She said yes. He then prescribed medication and she left. We asked the symptoms on which he based his diagnosis, and that if the problem was in liver or the spleen his colour would be the same. He said: when he came in he was scratching himself and I found his fingers cracked and dry, I understood that the scratching was because of the sand and that the substance that made him scratch must have come in touch with his hands and caused their cracking and dryness, and my diagnosis was right”. Al-Dkhwar was always very accurate in stating what he heard and from whom he heard it, to his pupil Ibn Abi Usaibi’ah, the authenticity of the story depends on the truth of its narrator Al-Dakhwar understood fully this point when he went to Tag al-Deen al-Kanadi’s assembly to acquire knowledge and benefit and later to pass it along to his own students. We also find this virtue in Abi Usaibi’ah’s book Uyun al-Anba’a. (61) When Ibn Abi Usaibi’ah was researching some sides of Amin al-Dawla Ibn al-Talmed, he asked al-Dakhwar who repeated to him what he had heard of stories with their references. These were related by Ibn Abi Usaibi’ah as he heard it from his master he says: “Al Hakim Mohazab al-Deen Abdel Rahman b. Ali, he says: Sheikh Mowafak al-Deen b. Ilias b. al-Motran say: my father told me: Ismail Ibn Rashid said: Abou al-Farag b. Thoma and Abou al-Farag the Christian said: We were gathered in the presence of Amin al-Dawla b. al-Talmeed when a women asked to enter with a young boy, he allowed her, when he saw the boy he told her that the son is suffering from burning while urinating and urinated sand. She said yes. He then prescribed medication and she left. We asked the symptoms on which he based his diagnosis, and that if the problem was in liver or the spleen his colour would be the same. He said: when he came in he was scratching himself and I found his fingers cracked and dry, I understood that the scratching was because of the sand and that the substance that made him scratch must have come in touch with his hands and caused their cracking and dryness, and my diagnosis was right. “Al-Dakhwar was always very accurate in stating what he heard and from whom he heard it, to his pupil Ibn Abi Usaibi’ah, the authenticity of the story depends on the truth of its narrator Al-Dakhwar understood fully this point when he went to Tag al-Deen al-Kanadi’s assembly to acquire knowledge and benefit and later to pass it along to his own students. We also find this virtue in Abi Usaibi’ah’s book “Uyun al Anba’a”.